At Aria Dental, we are committed to provide the most up-to-date and contemporary treatments and comprehensive dental care utilizing the latest and most advanced materials and equipment in dental industry. We don’t just add the “latest technology” without getting special training. 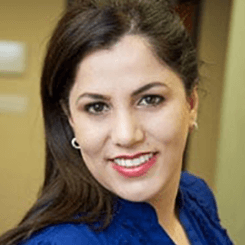 Dr. Maryam Horiyat, our team of American Board-Certified Specialists, and our hygienists are constantly continuing education and training in the latest techniques being developed, and when we come across technologies that we know will help in offering world-class services to our patients, improve the standard of patients’ dental care, and enhance the result of our patients’ experience, we implement them to our office. Digital X-rays use up to 90 percent less radiation than film x-rays. Our Dexis Platinum Digital X-Ray System, (TrueComfortTM Design and PureImageTM Technology) is able to deliver clinically meaningful images that are extremely clear, highly detailed, and most consistent images at lower doses. In addition, our digital X-rays enable us to detect cavities between teeth, determine bone levels, and analyze the health of the bone. We can also examine the roots and nerves of teeth, diagnose lesions such as cysts and tumors, as well as assess any damage when trauma occurs. Our practice offers PaX-i3D Green Cone Beam CT-Scan that provides 3-D imaging where traditional X-ray and Panoramic X-ray provide two-dimensional image. The 3D CT-Scan imag­­­­­­­­­­ing of your jaw bone and teeth can be vital for accurately viewing vital tissues such as nerves to precisely plan your treatments such as root canal treatments, dental implants placement, wisdom teeth extractions, cause of your TMD/TMJ. It also provides more predictable treatment outcomes, in which ultimately leads to more successful dental and surgical care. Digital CT-Scan also can be utilized to evaluate airways and throat for assessment of sleep apnea, snoring, or any other obstructive sleep disorders. 3D CT-Scan imaging delivers quicker and easier image acquisition; a typical scan takes only 20 seconds. The system offers active sagittal, coronal, and axial viewing and manipulation. It enhances diagnosis and treatment planning by providing more accurate imaging. By using the 3-D mapping tool, our skilled dentists at Aria Dental can easily format and select desired slices for immediate viewing. With One Shot Ceph feature of PaX-i3D Green Cone Beam, our dental professional can acquire high quality images with low X-ray dosage. In addition, short scan time reduces distortion caused by patients’ movement. ClinCheckⓇ is Invisalign own 3D animated treatment plan. With ClinCheckⓇ, Dr. Horiyat can create a custom 3D treatment plan for your Invisalign straightening program, which allows you not only to view your own teeth in 360° degrees and watch as they transform during the Invisalign process, but also to see your predicated Invisalign treatment result before you even begin the Invisalign process. To precisely design your final teeth position and help to achieve a healthy smile in harmony with your facial features, Dr. Horiyat utilizes this software to custom design your aligners sequence and check that they are the optimum movements. The digital impression typically is captured using an intraoral wand that is inserted into the patients' mouth and moved over the surface area of their teeth. The iTeroTM unit has been exceptionally accurate, reducing prosthetic remake to 0.5%. This concept allows digital STL file to be sent directly to a fabrication system for production of the restoration at the same time the milled models are being produced. ​This technology allows us to analyze the best position for your teeth scientifically; it allows us to get Invisalign, cosmetic dentistry, orthodontic, and implant dentistry results that harmonize with your facial features. Orthodontics have been used for hundreds of years, but the techniques we offer today are nothing like traditional orthodontics. We offer Invisalign®, which uses an algorithm to break your orthodontic treatment down into a number of short steps, then manufactures clear plastic aligners designed to accomplish those steps. we also offer Six Month Smiles®, which also uses computer planning to optimize orthodontic treatment and straighten your teeth. Although it uses brackets and wires, they are not like traditional braces. They are made fo advanced materials and advanced techniques to make your orthodontic treatment faster and more convenient. At Aria Dental, we use HD IRIS 3.0 Intraoral camera to capture clearly defined images of patients’ teeth that can be sharpened, magnified, and projected onto LED monitor for closer inspection. The intraoral camera is a powerfull tool to allow us to capture images of difficult to reach in the mouth and get a closer look at any potential or hidden prolem; it helps to enhance your understanding of your diagnosis. An intraoral camera does not cause any pain or discomfort to our patients and has no side effect. It captures clear images of the corroded or tarnished fillings, hairline fractures, bleeding gums, plaque, and several other critical teeth problems in real-time to an unparalleled degree, while our patients are comfortably seated in the dental chair. Although the human eye can detect subtle variation in color, but variable lighting and shadows in your mouth can make it more difficult for you to choose the exact match. Shadwave Computerized Color Matching stops all uncertainty and allows us to precisely match the color of your restoration to rest of your teeth. Diode soft tissue laser also known as “soft tissue handpiece” is used for gum disease treatment and gum recontouring without using a blade to cut your gum. This laser allows us to utilize sculpture techniques, precisely cut/remove the target tissue with less trauma and bleeding, and control infection by killing many of the bacteria at the wound site. This laser also has many benefits to patients such as improving post-operative pain/discomfort, decreasing postoperative swelling, and eliminating need for sutures. Virtually Pain-Free Dentistry...No Shot, No Drill, No Pain! 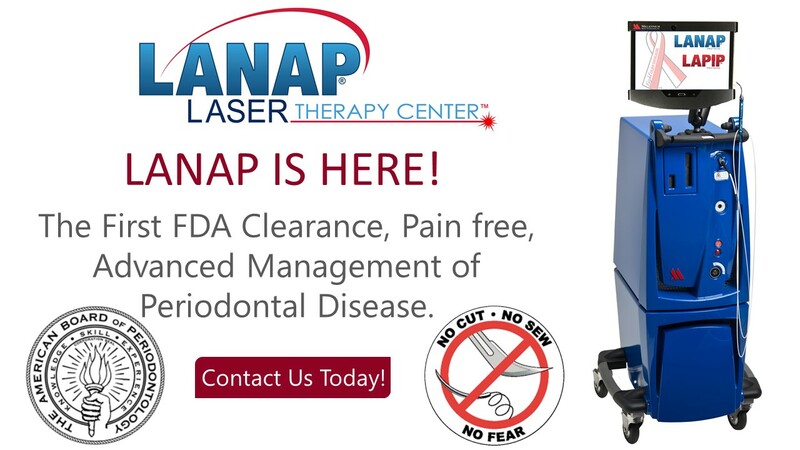 PerioLase®LANAP is breakthrough technology that not only helps you in avoiding the need for surgery, but also treats your sever gum disease and helps to regenerate bone and gum. We also utilize LANAP, which is FDA-approved laser to remove only diseased gum tissues without affecting the healthy issues. Proven by Both the U.S. Food and Drug Administration & the American Dental Association. Identifying, preventing, and treating dental problems in their earliest stages is one our most important priority. Our training and integration of new technologies allow us to provide minimally invasive and tooth preserving treatment. We have significantly enhanced our ability to diagonose cavities in their early stages by incorporating of the DIAGNOdent laser caries detection aid into our practice. The DIAGNOdent™ pen will show you where the decay lies and work quickly and reliably. The laser fluorescence detector within the DIAGNOdent pen is a precise method for identifying fissure caries, proximal caries and periodontitis. Metal fillings block X-rays, but DIAGNOdent™ pen will allow us to detect the cavities around metal fillings. We have learned that there are thousands of oral bacteria species living in your mouth. We also have learned that only a small number of these bacteria cause the gum disease. DNA testing allows us to create a profite of what bacteria are living in your mouth, so that we can get a better idea of gum disease risk. Our Ultrasonic Scaler Piezo is built-in. Our hygienists use Ultrasonic Scaler with the broadest frequency range that apply a high frequency south wave and the largest vibration amplitude to gently and painlessly break apart stubborn and hardened plaque and heavy stain from surface of your teeth and to wash away debris in the periodontal pocket. Aria Dental is dedicated to your safety and well-being; thus, we custom designed the most advanced and modern Sterilization Center with the best steam autoclave equipment with biological monitoring to efficiently control infection. With its single direction instrument flow, there is no crossover storage, further reducing the risk of contaminating sterile instruments. Consequently, our sterilization system always surpasses OSHA requirements. Dentrix helps your dental technology work together as one system. Efficiency comes first with Dentrix front office features. Easier scheduling, convenient interoffice communication and faster checkout help our patients as well as our team. 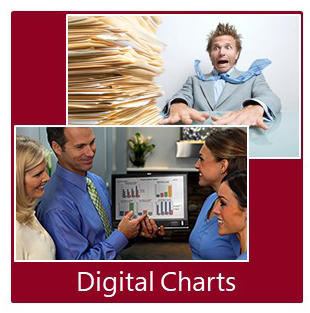 Professional benefits...automatic date/time and complete clean records. Aria Dental does not use city water system. We isolate the dental units from municipal water supply, select the quality of water to be used, and minimize the contamination and biofilm by self-contained water reservoirs, chemical treatment regimens, micro-filtration, and daily draining and drying of lines. Aria Dental offers relaxing massaging dental chairs that are sophisticated in styling, optimal patient access and exceptional patient comfort. The SerenEscape® system allows the patient to enhance their experience with a relaxing massage at different level and intensity and lumbar warms muscles for more relaxation and comfort. 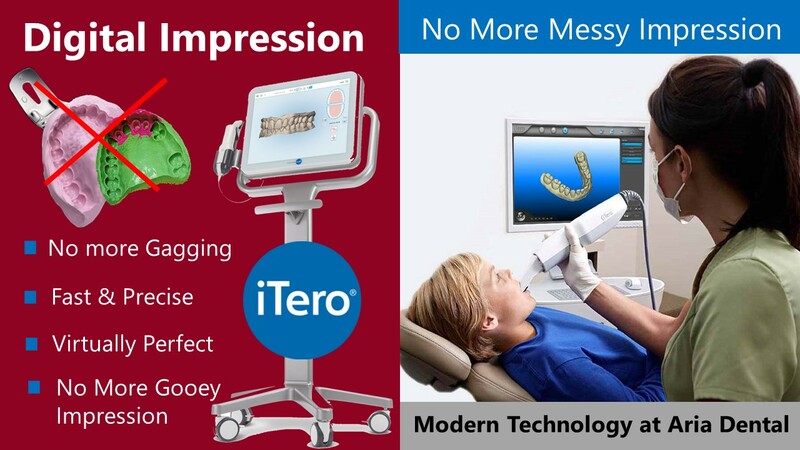 In addition, Endodontic Therapy, Surgical Laser System, Advanced STA anesthesia, Advanced Integrated Delivery System, Needless Oraqix Periodontal Anesthesia, and ISOLite System will make our treatments more efficient with excellent prognosis. From years of research, Aria Dental has created a world-class comprehensive dental Practice. If you have any questions about the technologies we offer and how they can improve your dental treatment, please call (949) 364-9600 or email us for an appointment with an Orange County's top cosmetic dentist.